We wanted to give a quick thank you to all the followers that have helped us to carve out a place here in the interwebs this past 18 months or so. 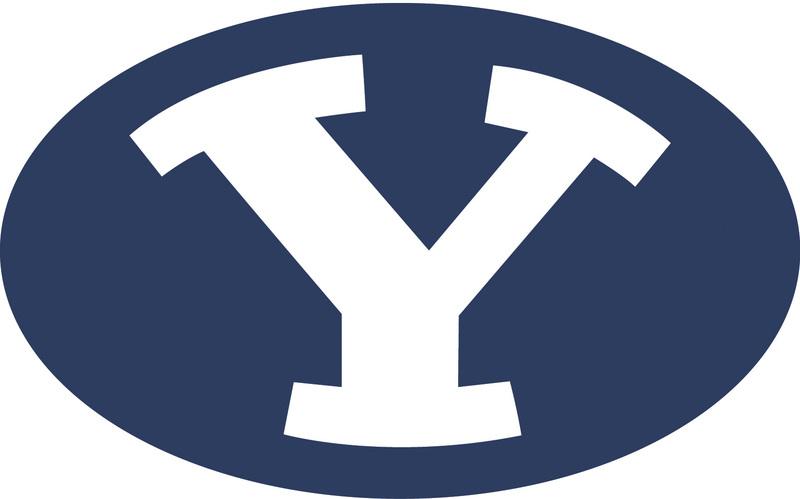 We’ve recently packed our bags and moved to Torn By Sports to write as the site’s primary BYU group. Check us out over there and keep following us on twitter @AI_SportsBlog. I’m going to hand out another podcast shout out to the Rise and Shout podcast. They frequently do over/under stats for BYU and I thought I’d come up with some of my own for the AI family and see what we could come up with. Check back this whole week for the next in depth look into BYU football. And finally, it’s time to look at the levels of production that we are all hoping to see from the team this year. Carl: I’m going more conservative with the team overall. I like the team and I like the potential. But I’ve been too ‘Blue goggles’ in the past to be overly confident. Maybe if I set the expectations lower, I’ll be pleasantly surprised when they overachieve, especially with the schedule before them. 8 wins is an acceptable season, more than that is gravy in my book. But please be that team to the north this year. Be looking for very competitive games and possible upset victories vs. Texas, Notre Dame and Wisconsin. 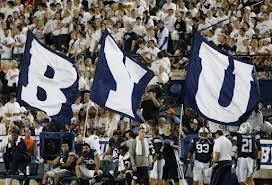 BYU will match up extremely well with those teams. Matt: I have this team winning 9 games this season which means that at least one of either home or road wins is low. I’m guessing it will be each by 0.50 games. 27.5 ppg is pretty potent, and I think we come up short, but not by much. I feel the total touchdowns is probably low while the team needs to make sure that they win the turnover margin this season. Mike: I like BYU’s chances this year. I see 8 wins with that brutal schedule. I hope it’s more. Points per game looks low. Total yards and TDs looks high. I still think Anae and Taysom need a year together before they put up dramatic numbers. Again the schedule will make all of these projections difficult to exceed. I am high on this year’s team, and as we get closer and closer to the beginning of the season, my expectations can only get more unrealistic. It’s silly to doubt the athletic ability of Taysom Hill, but his passing ability is open to criticism. However, how many reps was he really getting last year? How much practice did he get with the first-stringers? An entire offseason of preparation should benefit Hill greatly, and we’ll see a much improved offense, a much improved team. None of those marks are impossible to reach, but the total team touchdown one will be the most difficult to get to. BYU has two strong senior returners that could have made a jump to the pros this season but chose not to. Cody Hoffman is 18 receptions, 537 yards, and 2 touchdowns from becoming the all-time leader at BYU in each statistical category. Kyle Van Noy is one of the most exciting players this team has ever seen and his performance in the bowl game last year will not soon be forgotten. Carl: Cody Hoffman: Let me be crystal clear: if Hoffman is healthy, he will dominate games. His toughness, size, speed, hands and improved route-running, make him a double cover every down. That spells a slight downward revision to his overall production, but he’ll find ways to make sure he’s involved. Look for him to continue being our bread and butter through the air. KVN: I’m putting my chips down hard on Van Noy. During the first part of the season I expect him to get more pressure on him from offenses which will limit production. I hope this doesn’t discourage him because I feel that added pressure will be prevalent by all cougar fans. 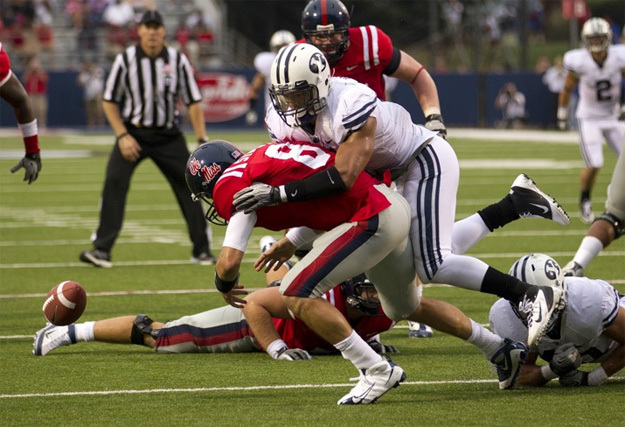 But if the other players around KVN step up, it will free him up to do what he does best. Matt: It is going to be fun to watch Hoffman eclipse all three of these BYU receiving records this season, probably by the time the calendar turns to November. 8.5 receptions is 110 for the year, while 125 yards equates to over 1600 yards. 13.5 touchdowns is certainly possible, but I think that this new offense will ask for a lot of short, underneath routes. Hoffman will be there grab possession passes and to stretch the field, but as a general rule, I think his numbers dip from last season for those reasons previously stated. I’m taking the under on Hoffman’s over/unders, but I’m taking the over on all three of his records. Van Noy is an interesting one to predict. These numbers are pretty close to last year’s production and without giving opponents something else to watch for, defenses are going to really focus in on KVN and prevent a repeat of what we saw in the bowl game in December. I think he’ll be closer to 0.5 sacks, 1.25 TFL, and 3.5 tackles per game while the INT and FF numbers might be about right. Mike: Cody Hoffman will be one of the elite receivers in college football if his yards and TDs are near these projections. As much as I love Cody I don’t see it. Defenses will key on him and I believe Taysom is still at least a year away. Van Noy is going to be even more keyed on and frankly with his great year last year he came nowhere near most of these projections. Kyle forced zero fumbles, had 2 picks last year. He did average 1.5 sacks with Ziggy. I see maybe 1 sack per game without Ziggy. Love Van Noy but if I was a competing offensive coordinator KVN would be priority #1. In a vacuum, maybe it is possible they could put up those kind of those kind of numbers, but there are other people on the team. I believe Taysom Hill will spread it around to all of his receivers, so I don’t think he’ll be able to get over 1,500 yards. Kyle is great at getting to the QB, but I just can’t see him getting over 18 sacks. I think both will have great season and up their draft stock, but I can’t see them doing all of that. With Jamaal Williams leading the staple of running backs, 2013 should be promising. Especially if Robert Anae’s offense clicks in, they will be carrying the ball 30 + plays per game this fall. That means Michael Alisa, Adam Hine, and even Paul Lasike and Iona Pritchard all have chances to be big contributors this season. Carl: As a group, the running backs will thrive. And Jamaal will have the opportunity to cease the starting role and run with it. Anae likes to go with primary running backs, as witnessed last season at Arizona and Ka’Deem Carey. He was 71 yards short of 2000 for the season. I hope Jamaal continues where he began last season. He could have a tremendous season if he does. Nevertheless, the production catching the football will be a must and the running backs will get their fair share of the receiving workload. Mike: I really hope Jamaal’s numbers exceed the examples below but I doubt it. Those are remarkable for a BYU running back. With Anae’s stable of running backs I can’t see JWill getting over 20 carries which leads to the rest his other stats falling short. As a unit I hope we see overs. With the exception of the receptions and total TDs I don’t see it. One would assume Anae will have his sophomore QB throwing to TEs and RBs which should lead to over 72 receptions. The total rushing TD prediction seems way low. Love the over there. Jamaal Williams is a great RB coming off a great freshman season. I definitely buy into the hype of him passing Harvey Unga as the all-time rushing leader at BYU (as long as he plays all four years), but I am not sure about 2013. Jamaal will be great, but the way Anae wants to run the offense, it seems like there will be a lot of sharing. I still expect Jamaal to get the most touches out of the running backs, but I don’t know if it will be fair to except nearly 1,300 yards from him this year. That said, I expect the running backs unit to definitely go over those marks. In fact, they weren’t that far off last season, and I expect more from them this year. In 2012, the BYU defense turned in arguably the best defense by a BYU team ever, if not, certain since that 1996 season. They finished in the top 3 nationally in total defense and it was highlighted by players like Kyle Van Noy and Ziggy Ansah. While names like Ziggy, Brandon Ogletree, Uona Kavienga, and Preston Hadley have left the team, Van Noy, Spencer Hadley, and a slew of newcomers will look to make 2013 an even better season. 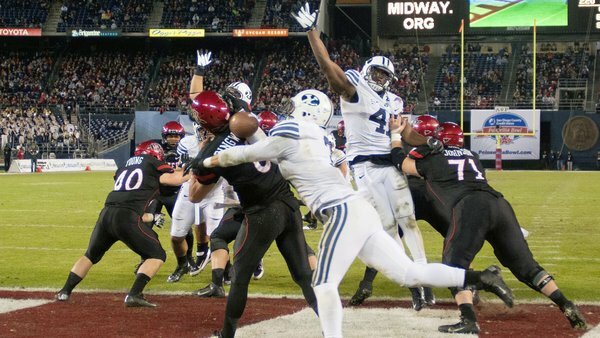 Can 2013 be another top 10 defense that BYU can hopefully pair with a drastically improved offense? 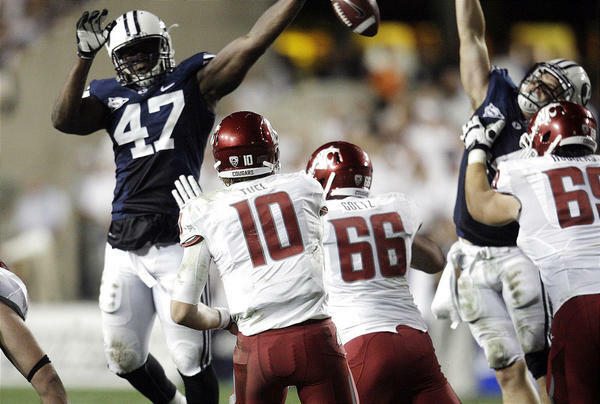 In order to get near that top 10 ranking in total team defense, BYU may need to reach some pretty lofty goals. Again, these numbers are representative of the 2012 top ten total defense, in which BYU was included. Carl: It’s safe to say we love the defense because Kyle Van Noy is returning for his senior year. Still, there are a lot of moving pieces to fill and the competition again may skew the numbers. Remember, a win is a win is a win, and this year’s defense won’t need to pressure themselves in to bettering last season’s staggering defensive numbers. With the tougher schedule, the stats are subject to rise, but this defense will compete with every team in front of them. Matt: If BYU is to truly “go fast and go hard” then I think that the defense should be fired up for the offensive production and step up their level of play. While these numbers are an average of the top ten, in most of the per game stats, it is a number well below BYU’s 3rd place rank in 2012. I think for the per game stats, BYU holds opponents under all the per game numbers. Unless they can find a wrecking crew replacement for Ziggy though, the season numbers all fall short as well. I think the final two stats work out to a push and a ranking higher than 10 but lower than the 3 they achieved in 2012. Mike: I do agree that BYU’s defense last year was one of the best ever. 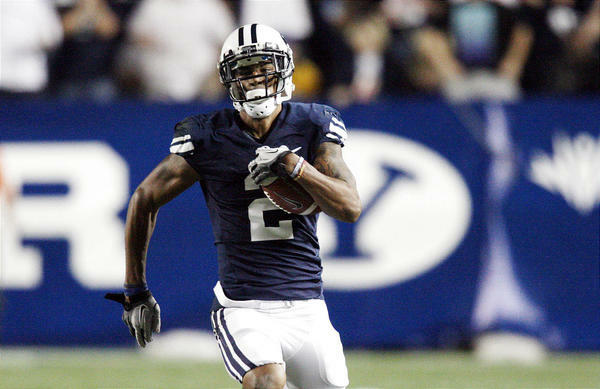 Two reasons BYU won’t be anywhere near last year’s statistics. 1) BYU lost their highest defensive NFL draft pick ever, two great BYU linebackers and the meat of a great BYU secondary. 2) BYU’s 2012 strength of schedule was a whopping 48th. Statistically USU (21st), San Jose St (30th) and Oregon State (43rd) were the top offenses BYU’s defense faced last year. BYU is facing perceivably their toughest schedule ever. Even with Van Noy’s return I see BYU statistically looking very average next year. Last season, BYU’s defense was absolutely amazing – probably the best ever. It is for this reason that I don’t think it will be recreated. Also, part of why the defense was so good last year – in my opinion – is that the room for error was zero. The defense didn’t have the luxury of giving up points and still winning games. The offense should be improved this year, and scoring more points coupled with the speed they wish to play at will make it difficult to keep the defensive statistics down. Taysom Hill is taking over in 2013 as the bold new leader of a team that has needed a leader that could rally the team AND play football for some time. Will Hill be that guy? I looked at the top 10 quarterback seasons of all-time according to Adam Mangum at Vanquish the Foe. I found some consistencies among this elite brotherhood that includes such heroic names as Ty Detmer, Steve, Young, Steve Sarkisian, and Jim McMahon. With all the hype coming out of Provo (hey, BYU fans are, if nothing else, masters of creating blue-goggle hype when nothing else is happening) I thought I’d see what it might take to get Taysom Hill into Adam’s top 10 this season. These numbers are the average of Adam’s top ten list. Carl: Taysom is going to have a decent year on paper. Expect Anae and Co. to get Taysom started much like Max Hall back in the day. The offense will be conservative to start, but expect Hill to graduate on to a bigger playbook. Generally, I’m putting a conservative ‘under’ value on most of the stats in question, mainly due to the strength of schedule. I like Taysom in a leadership, move-the-chains kind of role; doing whatever he can to get a fresh set of downs and keep the offense on the field. He won’t need to be flashy to make the offense move. Matt: I’m taking the under on all the passing stats and pushing on the rushing stats and here is why. If Hill had already had one full season under his belt as the starter or he wasn’t facing the level of talented opponents that he will be facing, I might be a bit more bullish on his potential in 2013, but as it is, the universe has conspired against him. We’ll see games where he will play at a pace that would allow him to reach these numbers, but there will be others, especially early, that will show us that he is still learning. I’m not saying he won’t have a great season; I just don’t think it makes Adam’s top ten list of all time. 2014 might be when we visit these numbers though. Mike: I’m going under on every one of these. The passing stats would put Taysom as one of the leading passers last year. I love the guy but as a sophomore there’s no way. As for the interceptions, I’m hopeful Anae won’t be throwing Taysom enough to get picked 15 times. Riley Nelson in one of the worst passing seasons in BYU history only threw 13 INTs. I think the rushing yards are close but I don’t see Taysom running as often as Doman ran him last year. Since Taysom Hill is my very first man-crush, I’m going to have to make a concerted effort to remove my bias from this. Taysom Hill is an exciting athlete to have at BYU … but he’s a sophomore. We don’t know how good of a passer he is yet, and it would be very difficult to go from having questions about his passing ability to him having a better season than either John Beck or Max Hall ever had at BYU. Plus, we don’t exactly know what Robert Anae’s offense will consist of. However, I do feel like there will be a running QB component, so while I am saying UNDER on his passing stats, I’m giving the OVER on his rushing stats. Ziggy was drafted #5 overall (first top five pick from BYU since Jim McMahon was drafted) and he’s going to the Lions. How do you feel about this as the place where Ziggy will finally learn how to really play football? Also, do you think he had any idea who Barry Sanders is? Carl: Just don’t fall in to the wrong crowd, Ziggy. Suh is a great football player and Ziggy can learn a ton from him. But don’t pick up on his antics. I’m all in with Ansah; I especially like his young motor and the fact that he’s driven to learn how to be successful. Detroit is a team he can learn quickly from and on the job. He’ll see playing time this season and I fully expect him to make a splash. As for Sanders, Ziggy now knows who Barry is. Matt: As far as a team goes, I like the Lions. They are defensive-minded and with Cliff Avril leaving, he may slide in and play right away. However, that comes with a potential pitfall; if he isn’t given the latitude to develop and learn, he’s going to find trouble. The coaches must be patient. And as Carl suggested, he needs to be mindful of who he surrounds himself with. I doubt Ziggy had any idea who that little guy was when he called his name, but he certainly does now. Mike: No chance Ziggy knew who Barry Sanders was. Detroit was the most under-achieving NFL team last year. From draft day tweets it looks like the Lions defense, namely Suh, Tulloch and Houston are thrilled to get a top pass rusher. With Suh and Nick Farley on the Lions D-Line Ziggy should flourish. Detroit is good for Ziggy. This past week Sporting News ranked all 125 head coaches in the FBS. Not surprisingly, Nick Saban headlines the list, but they ranked Bronco Mendenhall (17) and Kyle Whittingham (36) in the top 40. Do you agree with these rankings? Carl: Not sure why Mendenhall is ranked so highly. Then again, I don’t know what criteria formulates these ranking. Bronco is a great coach; he gets a lot out of his players and runs a clean program. But he hasn’t done as much as Whittingham has. Maybe Bronco looks better recently with overall records, but I wouldn’t put him that far ahead of Whittingham. And K Whitt still owns the head to head. Matt: Meh. The top of the list is fine, but Bronco isn’t the 17th best coach in the nation. If he can successfully navigate this season (at least 9 wins) then maybe he can be in that discussion. If you asked this after 2008, then Kyle is approaching the right level, but right now, he can’t be that high. He hasn’t figured out how to win in the Pac 12 yet and until he finds the right recipe, he can’t be ranked this high. I think this is too high for both of them. Mike: Agreed with Saban at #1. How Urban Meyer gets the nod above Chris Peterson defies galactic logic. What Peterson has built at Boise St with left over recruits is the most remarkable thing in college football. Bronco has to be proud of a 17th ranking. It reflects a national respect that his Happy Valley critics need to recognize. It appears the honeymoon is over for Kyle Whittingham. Being ranked 36th shows how poorly a BCS winning program has looked since being on the PAC12 stage. Only Lane Kiffin looks worse at #43. Scott: I love Bronco Mendenhall, and I might be one of the biggest Bronco apologists. But 17th? That does seem a little high. Then again, I think we sometimes lose focus on the difficulty of the task of being the head football coach at BYU. Considering the recruiting restrictions brought on by the Honor Code and academic requirements, it’s actually quite amazing he’s never had a losing season, especially when you consider he took over after the third consecutive losing season. Yes, many of us were disappointed in the results of the last two seasons, but I believe BYU is a program on the rise again. As far as Kyle Whittingham is concerned, I’m not sure. He did take over for a program that had just finished in the top 5. After a few mediocre seasons, they won the Sugar Bowl. However, the results since then have probably been underwhelming. A lot of Utah fans will scoff at the idea of Whittingham being below Bronco on this list, but Bronco almost never loses to teams he should beat. That can’t be said for Whitt. Last week Ryan Teeples wrote about the top six future road trips and the worst five road trips for BYU as they continue on this independent schedule. Of the games already on the schedule, what would your top three roadies be? 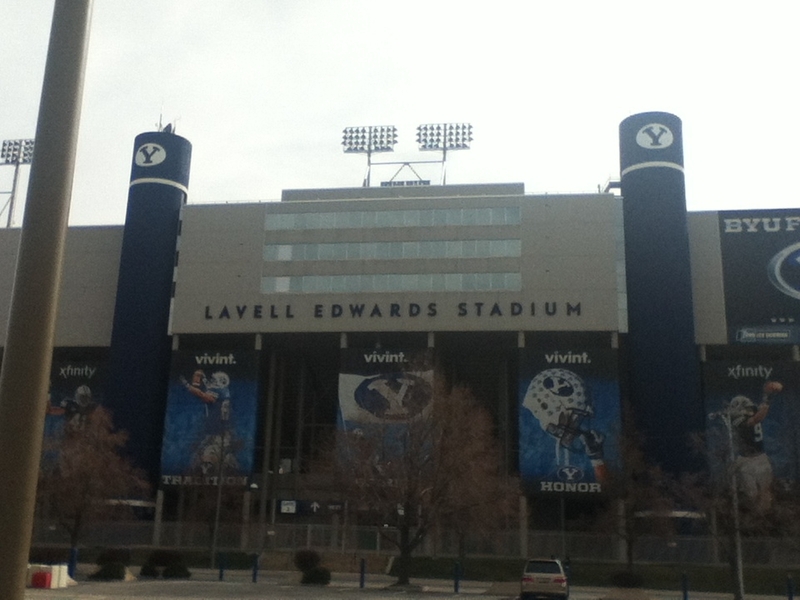 What would be one more roadie that you’d like to see BYU add to its schedule? Carl: In no particular order, I’d like to see Michigan, Nebraska and Texas. Certainly finances put a damper on that. But if things work out right, I’ll be going Austin to see Texas. I’m a big fan of the atmosphere in the SEC and BYU fans got a taste with Ole Miss recently. Unrealistically, I’d like BYU going to LSU, Florida, Georgia. More realistically, I’d like to see Virginia Tech. Matt: My top three have to be South Bend, Michigan, and Washington DC in 2016. If things work out, I’ll join Carl in Austin. That has to happen. I would like to see a game in the Shoe or the Swamp. Mike: My upcoming Top 3 are Notre Dame ’13, Michigan ’15 and Texas ’14. I’ve been to ND and Texas and both are brilliant. The Big House in Ann Arbor might be better. My and 1 roadie would be Death Valley, LA vs LSU. Even though it would most likely result in a BYU beat down of epic proportions I’ve heard the urban legends of Death Valley on a Saturday night and I want to go. Scott: I went to the Ole Miss and Notre Dame games, and they were a lot of fun. But when I go to games, I don’t really do a lot outside of going to the games, so I am probably not the person to talk to when it comes to the quality of road trips. I definitely agree with both of Ryan’s lists, however, I would probably add one or two to the list of good ones. I live in the Midwest, so anytime I am able to see BYU play, it’s a great road trip. While Madison, Wisconsin may not seem like a great place to visit, the thought of visiting Camp Randall excites me. Additionally, the trip to Cincinnati appeals to me, because it is only two hours away. Makes it a day trip, instead of having to pay a bunch for a hotel room. I guess I’m not that cool of a guy to travel with. It’s no secret that Jimmer has struggled in his first two seasons in Sacramento. With all the changes happening with the Kings right now, who knows how that will affect him. If Jimmer were to be traded, where do you think would be the best place for him to be traded to and why. Carl: That’s a tougher question, because I don’t follow NBA as much as I used to, but my first thought was a team like Indiana. A team who’s always looking for quality role players to work around Granger and Co. Let’s face it though, Jimmer is going to be a role player. He needs to learn his new role in order to be successful anywhere he may go. Matt: 1st off, I don’t think anyone can be successful in Sacramento until they figure out what they are doing and more importantly learn how to play basketball as a team. 2nd thing, I don’t think Jimmer can be successful in Sacrament, ever. 3rd, I don’t know which team would be best, but I just don’t think the Jazz would be a good fit either. Too many expectations. He should go play in Miami and be a 15 minutes off the bench 3-point shooter where he can do what he does best. Mike: The Jazz would be the obvious best destination. Jazz fans sell out so many Kings/Jazz games that the Millers requested more Kings games. I doubt Jimmer could do any wrong in this state. Not to mention he’d provide the outside shooting that the Jazz clearly lack. Adding Jimmer to the Jazz young roster would be brilliant. I think like Steph Curry, Jimmer could still develop given a chance that doesn’t exist in Sacramento. Scott: I’m not 100% sure Jimmer has to leave Sacramento. Whatever ends up happening with the Kings, I would be surprised if Keith Smart is still the coach next year. If the new coach believes in Jimmer and wants him to be the sixth man (which I think is probably the best-case scenario for Jimmer’s NBA career), Sacramento could be the best spot for him, but there’d have to be some roster cleanup. Good ownership for that team will go a long way. However, if he has to get traded to get that opportunity, why not the Los Angeles Clippers? Eric Bledsoe is likely going to be gone soon, because the Clippers can’t afford him. He might be a great bench guy to give Chris Paul a breather every once in a while. Additionally, CP3 could maybe help teach him to play better defense. He’d be on a good team, and BYU fans might enjoy watching him. Or the Utah Jazz. They could probably use a three-point shooter.